9A-91 is a fairly decent Night unit who, like most Night units, has a mediocre, if not outright terrible, daytime performance. She has below average Damage, about average Accuracy, and somewhat above average Rate of Fire. It is her Skill which allows her to outperform most other standard ARs during a Night mission, as it offers a 180% increase to her Damage. 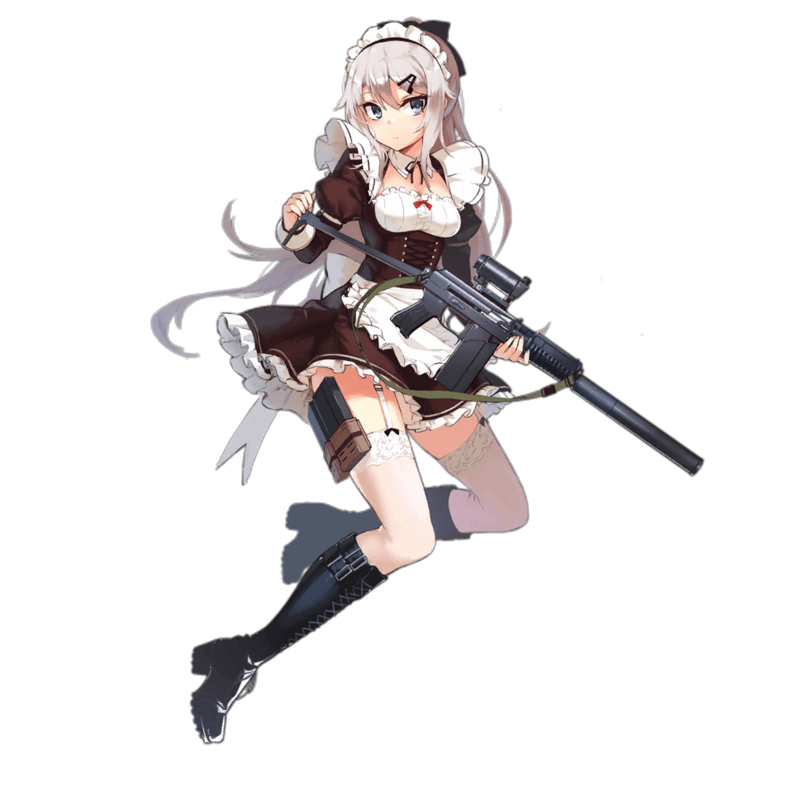 Her tile buff, which gives a 15% Evasion buff and 10% RoF buff to SMGs, are useful but not exceptionally helpful for two reasons: Night Echelons typically don’t contain a main SMG tank (forgoing them for a HG like Mk23 or Welrod instead), and even if an SMG is included, the tile position means 9A-91 will likely only be buffing one SMG at a time. While 9A-91 isn’t the best Night AR, she is definitely a good one, and is one of the more affordable ones too, considering that unlike OTs-14, she can be produced. Due to being one of the few ARs with a Night DPS Skill, 9A-91 does a good amount of DPS at night. This Skill in fact lets her outpace most other ARs in Damage dealt at night. Due to having a relatively poor Damage stat and a Skill that becomes less effective at daytime, 9A-91’s DPS suffers during the Day. Unfortunately for 9A-91, OTs-14 outperforms her massively in DPS at Night due to having a better Damage stat, better Accuracy and better multiplier on her skill. This isn’t to say 9A-91 is bad however, as there are very few specialized Night ARs. 9A-91 is very unimpressive at a first glance. Her 42 Damage is unexceptional for an AR, while her 78 RoF isn’t stellar either. As a matter of fact, without her Skill, she has a quite low DPS output, as her Skill actually accounts for most of it. 9A-91’s Skill, Damage Focus N, really shines at Night. It provides a 180% increase in Damage during the nighttime, but a disappointing 60% Damage increase at daytime, also featuring a 5 second Initial Cooldown and a 6 second duration. It is this Skill that easily lets 9A-91 outperform conventional ARs at Night, however, it causes her to heavily underperform outside of this specific scenario. It should be noted that this is also the exact same Skill as AS Val possesses, and since 9A-91 has better relevant stats than AS Val, this makes her the objectively better choice to use when comparing the two. 9A-91’s tile buff is a 15% Evasion and 10% Rate of Fire buff to SMGs, and while the RoF buff isn’t particularly useful, the Evasion buff is usually appreciated. The positioning, though usually only allowing her to buff one SMG, allows her to be placed in practically any backline position and still make use of her tile buff. Sadly, since she is a Night AR, that means she’ll almost always be run in a team without an SMG main tank, nullifying the most useful aspect of her tiles. Overall, 9A-91 is a decent choice for a Night unit. While she certainly is not as useful as OTs-14, she is much easier to acquire, and therefore much easier to Dummy Link. Since there are also currently a very limited amount of Night ARs, this makes 9A-91’s position of the best producible Night AR fairly uncontested. Since 9A-91 will usually be on a team meant for Night, she should be run with ARs good for Nighttime. ARs such as OTs-14 and M4 SOPMOD II fit the bill. 9A-91 has a fairly low Damage stat, and therefore one should run SMGs that help improve her damage output. UMP45, PPS-43, and SR-3MP help her out. Again, since 9A-91 has a fairly low Damage output, HGs that can change that even a bit will boost her performance HGs such as Mk23, MP-446, or Grizzly will do this job well. A standard 3AR 1SMG 1HG formation works well with 9A-91. As a note, while 9A-91 one can be put in the middle, it is not recommended since the offtank will not really benefit much from her tiles. The Russian carbine assault rifle, 9A-91, was first introduced in 1993 as a cheaper alternative to the SR-3. The weapon is mostly used by Russian police forces and the FSB. It’s notable that even though the effective range of the weapon is fairly short, it has a sniper rifle variant, known as the VSK-94.